OPEC's crude production fell to the lowest in almost three years as Venezuela's woes continued to mount. The size of Venezuela's production declines are matching those of Saudi Arabia, the International Energy Agency said in its monthly report. However, the essential difference is Venezuela's reduction is unintentional with the Latin American nation's oil industry suffering from “chronic mismanagement,” the IEA said. The collapse of Venezuela's oil industry is partly a reason the Organization of Petroleum Exporting Countries has over-delivered on its pledge to curb supply. The group and its allies including Russia are not only nearing their target of bringing global stockpiles back in line with five-year averages, but are starting to suggest markets may tighten sharply later this year. OPEC's compliance with its pledged cuts in March rose to a record 163 percent in February, the IEA said. “To all intents and purposes, more than a second Saudi Arabia has been added to the output agreement,” the IEA said. Venezuela's oil production last month was 580,000 barrels a day below its reference level of 2.07 million barrels a day. 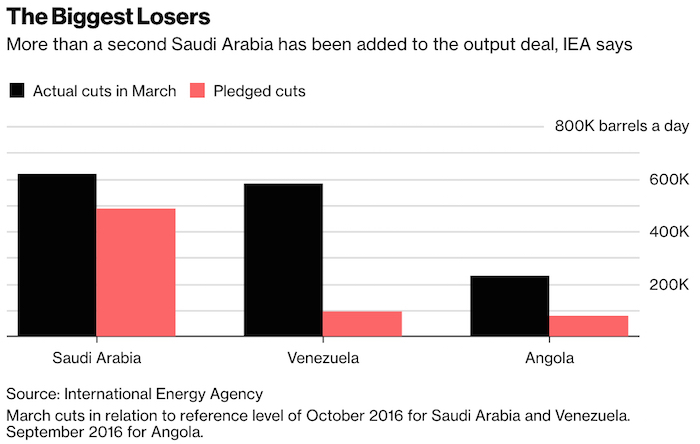 That's just shy of Saudi Arabia's 620,000 barrel-a-day cut in March. Venezuela had originally agreed to slash 95,000 barrels a day when it signed the deal. The pain is set to continue. The Latin American nation's output capacity is likely to drop to 1.38 million barrels a day by the end of the year, the lowest level since the late 1940s, Paris-based IEA said. Production fell to 1.49 million barrels a day in March from 1.55 million barrels in February, helping boost its compliance rate to 607 percent. “Difficulties in sourcing diluents, payment issues and ongoing operational challenges are likely to lead to further production declines,” the agency said. Production in Saudi Arabia, OPEC's biggest producer and its de-facto leader, fell a further 40,000 barrels a day in March to 9.92 million barrels a day. Algeria's output fell to just below 1 million barrels a day, the lowest since 2002, after maintenance at Hassi Berkine South and Bir Rebaa North fields. Angolan production fell further to 1.52 million barrels a day, the lowest since October 2016, mostly because of natural declines at mature fields. Iraq, OPEC's second biggest producer, pumped 4.44 million barrels a day. Its compliance rate was 58 percent in March, the worst among the participants in the supply-cut deal.